- "Peaches en regalia" and "Son of Mr. Green genes". Two relatively relaxed pieces. - "Willie the pimp" and "The Gumbo variations". Tracks based upon a riff followed by extensive soloing. - "Little umbrellas" and "It must be a camel". Complicated music with various interwoven melodic lines. Especially "It must be a camel" is harmonically versatile. The album shows the synergy of the cooperation between Zappa and Ian Underwood. Ian Underwood made his first appearance on Uncle Meat and pleased Zappa by being able to play all kinds of complicated music, taking away some limitations Zappa had had to deal with earlier. Underwood got stimulated to reach the level he's demonstrating in his saxophone soloing in "The Gumbo variations". The majority of the parts of "Little umbrellas" and "It must be a camel" are played by Underwood, where Zappa is applying a lot of overdubbing. 0:00 Block A (bars 1-2 in the example below). Theme I in B Dorian. 0:21 Block B (bars 5-8 in the example below). Theme II in B minor. See also the Tinsel Town rebellion section for more details about this section, where it re-appears as "Peaches III". 0:41 Block C (bar 13 etc.). Third theme. This theme begins with a two-bar motif in B Dorian. Hereafter this motif gets transposed twice, as D Dorian and F Dorian. Next you've got another motif in Db Mixolydian, followed by yet another motif in B Mixolydian. 1:05 Blocks D-E. The song continues in an improvised manner. A melody is played over a I-II alternation in E, followed by a I-VII alternation in A Lydian. 1:34 Block F. A melody over a chord progression, using two different scales per bar and ending in G Mixolydian. 1:46 Block G. Chord progression in F, being I-V-IV. 2:05 Block H. Variation upon the material from block F, beginning with the first bar transposed down a minor third. 2:16 Block I goes like block A. 2:35 Block J goes like block B.
Peaches en regalia, themes A, B and the beginning of C (midi file). Peaches en regalia, themes A, B and the beginning of C (transcription). "Peaches en regalia" has become a Zappa classic in another sense as well. It's generally appreciated and Zappa recorded it three times. In 1971 Flo and Eddie did some of the parts vocally for the live version on "Fillmore East". Ten years later another live version appeared on "Tinsel town rebellion", called "Peaches III". To quote Zappa from the album liner notes: "It is called Peaches III because this is the third time I have released Peaches (En Regalia) on record ... first on the Hot Rats album, then on Live At The Fillmore ... but this version is so bizarre, I figure you wouldn't mind hearing it again". The bizarreness doesn't so much relate to the composed part as on "Hot rats", but more to the epilogue with the "Let's hear it for another great Italian" section followed by the concert ending lines. See the Tinsel town rebellion section for an outtake from this version. "Peaches III" has some extra counterpoint figures at the return of theme B, that also appear as pizzicato notes in the Ensemble Modern version on their "Greggery Peccary and other persuasions" CD from 2003 (see also the left menu). 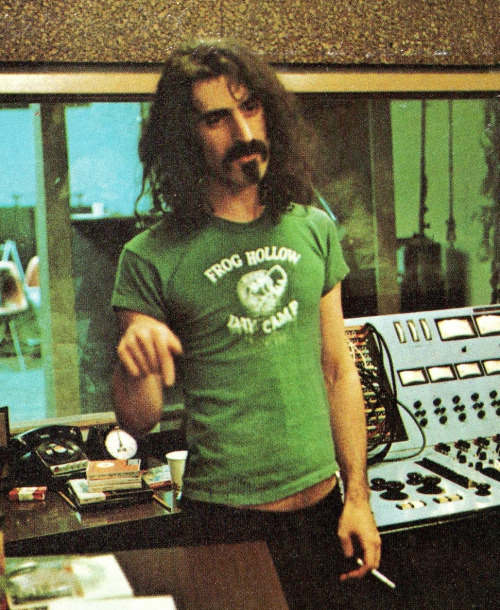 Image above to the right: Zappa during the recording of Hot rats (sample from the album cover). "Willie the pimp" exists in three version in Zappa's catalogue. On "Hot rats" it's the only track with lyrics, having Captain Beefheart singing them. Below his image on some sort of emblem from the CD leaflet. - 0:00 Main theme, introduced instrumentally. 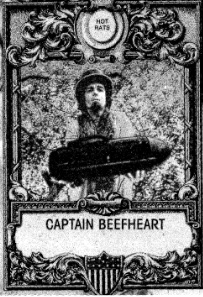 Next Beefheart starts with the lyrics ("I'm a little pimp with my hair gassed back ..."). - 1:07 Shorter sung side theme ("Hot meat, hot rats, hot cash, hot ritz ..."). The bass starts varying the main theme, gradually moving towards a free improvisation, though maintaining an A pedal type of accompaniment (the song is in A Dorian throughout). Zappa starts soloing. - 2:13 The piece continues instrumentally. - 8:48 The main theme returns. - 0:00 2nd appearance of the "Latex solar beef" theme. As I understand it there are other releases with this section being part of "Latex solar beef" itself. My CD has Rykodisc RCD 10512 as release number. - 1:01 Main theme from "Willie the Pimp" (1971), played instrumentally as in the example included in this study. While the "Hot rats" rendition is melodic, this version contains a chord progression as well. Because the side theme from above is textual rather than melodic, it doesn't return in this version without lyrics. - 1:31 The main theme is used as the starting point for a guitar solo, called part one of it. Part two was the opening track of side two of the original album edition, but got skipped on the CD re-release. - 0:21 Additional theme ("she can't be (beat) ..."). - 0:31 The main theme and additional theme get repeated. - 0:51 Main theme some more, followed by the side theme from above, this time with a fixed accompaniment figure. - 1:05 Guitar solo over an inversion of this figure. - 1:57 The solo ends with the opening melody from "Montana", into which song this track segues. Willie the Pimp solo, 2:34-2:52 (midi file). Willie the Pimp solo, 2:34-2:52 (transcription). When you compare the solo example from above - or pages 15-29 from the Hot rats guitar book - with the Frank Zappa guitar book from 1982, you can see that the solo from "Willie the pimp" is untypical of Zappa. This goes for more solos from the sixties. There are relatively few of them on album and Zappa hadn't yet developed his personal style as explicitly as at the end of the seventies. In this case he's about always following the downbeat and playing on beat too. The 16th note is the central time unit and there are few accelerations and irregular rhythmic groupings (apart from triplets). There are many bars with him using chords (as in the example from above), something he would call a "rhythm guitar solo". See the "Chunga's revenge" solo from 1975 from the Joe's series section from this study for a clear example of such a rhythm guitar solo. Technically and, as it comes to variation, the existance of these solos is of interest. I'm also adressing to the difference between earlier and later solos in the Fillmore East 1970 section of this study as it comes to the interaction between players. In this case the contribution of Max Bennett on bass is of importance. At some points it sounds as if Zappa and Bennett are playing a duet. On the other hand the keyboard part stays in the background, being a sustained pianissimo Am chord most of the time. - I-IV alternation in D Dorian. - I-VI alternation in C, followed by IV-V-VI. - Ending in Bb Mixolydian or Bb Dorian (both D natural and Db are getting used). Ultimately, at the end of this piece, it's closing in D Mixolydian. Guitar transcriptions from most parts from "Hot rats" have been published as the Hot rats guitar book, Hal Leonard publ. comp., Milwaukee, 2001. The transcriptions are by Andy Aledort. Above are the opening bars of the soloing over the I-IV alternation in D Dorian. - 0:00 Theme A, played twice. - 2:17 Theme B returns. - 2:31 Theme A returns. Ludwig's study has the main melody of "Little umbrellas", whereas about 2/3rd of "Hot rats" got transcribed in 2001 by Andy Aledort (the "It must be a camel" section from below was published just before this release). Andy also includes the main melody of "Little umbrellas", but skipped the middle block. Apart from Zappa's own solos he doesn't include the overdubbed and improvised parts, other than by chord indications. For a cover band that could be enough. This section is about overdubbing and the midi files are intended to approach the exact album versions, so more details are included. Little umbrellas, 0:36 till 1:16 (midi file). Little umbrellas, 0:36 till 1:16 (transcription). This first example below contains the repetition of theme A plus the larger part of theme B. The first two bars are accompanied by a Dsus2 and Fm7 chord progression. Both Wolfgang Ludwig and Andy Aledort are notating "Little umbrellas" in D minor. If you want to relate this song to any key, then D minor or Dorian is indeed the only option. The D-F movement dominates. You've got a lot of altered notes that way though. In the 4th pdf edition of this study I'm suggesting that the scale over the Dsus2 chord could be interpreted as D major, but after relisting I would like to withdraw that. The D chord I first notated should be Dsus2 and the bass line plays a C right from the beginning. So, without an F#, there's insufficient ground for doing so, and the C# in the melody should be interpreted as a chromatic passing note. Bars 5-6 have varying pedal notes and incomplete scales, so the scales can't be identified positively (it's also hard to hear each individual note here). The piano plays the extended chords in improvised arpeggio forms (staves 2-3). Bar 7-8 don't follow a specific key. Bars 9-10 are stable again, here in A minor. The main theme is played three times, each time sounding different. The basic notes of the melody are identical each time, but the overdubs create a different harmonic climate in every repetition of the theme. In bar 11 of theme B the overdubbed line is playing a counterpoint line. It's getting chromatic here with only fragments of scales being used. The middle block of "Little umbrellas" is a strong example of overdubbing, because Ian Underwood is playing three keyboard parts with individual lines. The bass is setting a pedal note per bar. The result is dense harmonies and counterpoint, difficult to transcribe. Next is the section from this middle block between 1:20 and 1:35. Little umbrellas, 1:20 till 1:35 (midi file). Little umbrellas, 1:20 till 1:35 (transcription). This middle block is built over an eight bar progression with a chord per bar, repeated twice, as indicated in Andy's songbook. Included above are the first four of these bars with the progression E-F#-G-A. Over these chords two or three melodies are played, moving freely through the scales, that change per bar (E, F#, G and A Mixolydian). In the example above however bar 4 appears as A minor/Phrygian (the C/C# is absent, the F is natural while the B turns up as natural and flat). Thus the whole becomes to sound as a series of harmonic fields, blending all notes of a scale in each bar. 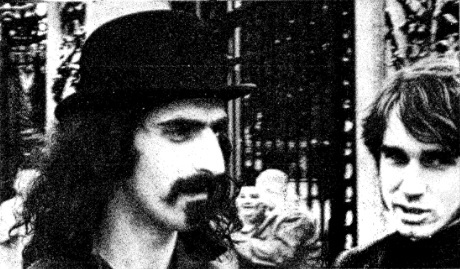 Ian Underwood with Zappa in London (CD leaflet). The "Gumbo variations" is the largest piece on the album, 16 minutes in total, including extensive soloing. Its central theme is a two-bar riff, that gets varied upon a couple of times (see bars 9-10 of the first example for its introduction). The Gumbo variations, 0:13 till 0:46 (midi file). The Gumbo variations, 0:13 till 0:46 (transcription). Motifs taken from this theme turn up during the sax solo as well as forming a returning element in the guitar accompaniment. It gets preceded by one of the many bass riffs that you can find in this song. During bars 9-14 this bass riff keeps playing against the central theme. The opening contains the principal chord progression that accompanies the lead melody and the soloing: G7-C-G, a standard progression with the dominant 7th chord resolving. As you can read in the "Real FZ book", Zappa didn't particularly like the idea of resolving chords, but he didn't oppose it altogether neither. You can see the same progression at the beginning of "I was a teenage maltshop" and as part of the "Cheap thrills"/"No, no, no" accompanying chords. For examples of the use of the dominant 7th both resolving and non-resolving , see the Frank Zappa songbook vol. I, pages 22-23 and 70. At the other side of the spectrum you have for instance the chord alternation from "Black napkins", C#m7-Dmaj7. Here the two 7th chords not only don't resolve, but change scales as well. Interesting to see is the simultaneous use of two scales. The "Gumbo variations" start in G Mixolydian. This basis continues when the central theme enters the picture, but both this theme and most of the soloing are using a Bb instead of a B. So Zappa is here blending G Mixolydian and G Dorian. The Gumbo variations, 9:40 till 10:05 (midi file). The Gumbo variations, 9:40 till 10:05 (transcription). This second example is a section from this song with the band modulating. It's the part with Don "Sugarcane" Harris playing an electric violin solo. In bar 4 the guitar plays a progression using Bb, setting the key more clearly to G Dorian. Max Bennett on bass comes up with another syncopic riff. He immediately modulates to D minor from bar 5 onwards by changing the pedal note. In bar 12 we're back at G Dorian with simply G as a bass pedal note. The overdubbing reaches a climax by creating a modern orchestral atmosphere in the intriguing part between 1:45 and 2:25 on "It must be a camel". I've transcribed 11 bars below. Because of its harmonic density the transcription can only be an approximation of what's going on. These bars are also an example of Zappa's search for rhythmic diversity. Within a 3/4 framework several varieties are being used. Several bars have syncopic figures, some bars have a subdivision into two, while bar 8 is straight. It must be a camel, section (midi file). It must be a camel, section (transcription). Bar 1: Most sections begin with a little arpeggio chord. This section starts in A (major or Lydian) and almost immediately falls into an 13th chord by extending the A chord with a B and an F#. Bar 2: In the second bar the key changes to G# Dorian. The changing of scales and the use of enlarged chords continue except for bars 9 and 10, which are normal and form a short break. In both bar 1 and 2 the parts are playing via counterpoint and harmonic complementary lines. Bar 3: G Phrygian. The descant moves on with parallel fourths on beats 2-3. Bar 4: F Aeolian. On the left and right channel you can hear two different strings of fast notes played simultaneously. Bar 5: G Aeolian or Dorian. The last string from bar 4 leads to another extended chord. Some more parallel fourths lead downwards to bar 6. Bar 6: Two extended chords alternate in a syncopic manner. For the remainder of this example there are no clear pedal notes anymore. Bar 7: The opening chord returns a 16th note behind the meter line. Two other chords lead to bar 8, again in a syncopic manner. Bar 8: The descant sustains a chord, while the bass plays six triads as a series of plain eight notes. Bar 9-10: The 3/4 meter gets subdivided into two. Here the descant is briefly using single notes instead of chords. Bar 11: Yet again an extended chord, here with a tremolo on top of it. Opening chords from "It must be a camel", showing the use of sus2, sus4 and 9th chords (Hot rats guitar book). These in traditional harmony uncommon chords set the atmosphere of the song. It opens gently with the keyboard and bass playing. In the LP era the length of an album and its format could sometimes be a problem. A contractual side was expected to last between 15 and 20 minutes, some minutes over 20 being possible. Since the latter diminished the sound quality, Zappa avoided that. Then the next size step from a single album was a double album. An EP or a blank side as a way in between never got popular. You can see that for strongly conceptual albums as "Joe's garage" and "Thing-Fish" choices had to be made. In the case of "Joe's garage" the story ends with "Watermelon in eastern hay", leaving still half of a side remaining. It was solved by including the "Little green rosetta" jam. For "Thing-Fish" the quantity of the play got between a double and a triple album. It could fit on a double album, but then you would for instance be forced to cut "The torchum never stops" into two. In this case Zappa made no concessions and chose for six short sides, shorter than normal. With the entrance of the CD this problem belonged to the past. Above: Frank and Gail, around 1969. - Chunga's revenge: Twenty small cigars. - The lost episodes: Lil' Clanton shuffle. - Hot rats CD: extension of the Gumbo variations sax solo. - The lost episodes: Sharleena. "Twenty small cigars" from "Chunga's revenge" comes into this album directly from the 1969 "Hot rats" sessions. Other than "Sharleena" it wasn't re-recorded with the new band formed in the summer of 1970. Twenty small cigars, opening (midi file). Twenty small cigars, opening (transcription). It opens with a piano introduction. Just as the "It must be a camel" example from above it contains enlarged chords (bars 1, 3, 5-7), alternating with normal 5th chords (bars 2 and 4). It's in E Dorian most of the time. The chord in bar 1, staff 1, is V 11th if you take the B as root. Again rhythmic complexities enter the picture, as the syncopic triplets movement in bars 5 and 6, gliding over a 3/4 basis. In bar 9 the main melody starts with one of the few instances of Zappa playing keyboard and guitar. It's a peaceful entirely instrumental song.